Food for People continues to partner with the North Coast Grower's Association (NCGA) farmers’ markets' Market Match program. With this program, households can stretch their CalFresh benefits and access more of the locally grown foods sold at NCGA farmers’ markets in Eureka, Arcata, McKinleyville, Willow Creek, Fortuna, and at the farmers' market in Garberville, thanks to a bonus of FREE Market Match dollar tokens provided on top of what they spend in CalFresh benefits at farmers' market. How do I access CalFresh and Market Match at farmers' markets? Accessing CalFresh benefits at farmers’ market is easy. 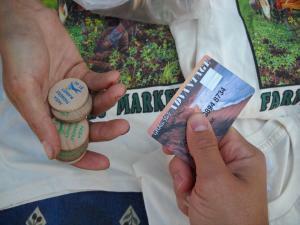 Visit the market info booth, where staff will swipe your EBT card for the amount you choose. Then the market manager provides $1 wooden tokens that can be used like cash at the farmers’ stalls to purchase fresh fruits, vegetables, eggs, poultry, meat, nuts, cheese, bread, and seeds/plants that produce food in a garden. Thanks to the Market Match program, you will also receive a bonus of free Market Match dollar tokens on top of that, to stretch your CalFresh dollars further for fresh fruits and vegetables. This bonus matching benefit is available once per market day, all season long as funds permit. Not currently receiving CalFresh but interested in knowing if you qualify? Stop by Food for People for our CalFresh open office hours any Monday from 9am-3pm to learn more and/or apply on the spot. Call Food for People for CalFresh application assistance (707) 445-3166 ext. 308 or 318. Staff at the farmers' market info booth at most farmers’ markets can pre-screen you for eligibility and help you get the application process started. Call the Humboldt County Department of Health and Human Services at 1-877-410-8809. Eligibility interviews can be conducted by phone. or apply online at www.c4yourself.com. The premier of Market Match in 2011 was a smashing success. 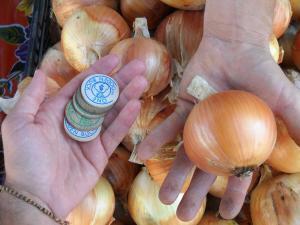 EBT usage at NCGA farmers’ markets increased 313% from the year before. NCGA Farmers’ Markets began accepting CalFresh in 2005 and the concept caught on slowly. Only $5,493 in EBT benefits were redeemed during the entire 2008 market season. By 2010, it almost doubled to $10,973. After introducing Market Match in 2011, redemption more than tripled to $34,363. By the 2013 season, CalFresh shoppers at NCGA Farmers' Markets spent $52,177 thanks to community-wide education on utilizing CalFresh and accessing Market Match at local farmers' markets. CalFresh shoppers spent $4,736 at Fortuna and Garberville markets combined. Shopping at farmers’ markets with CalFresh helps families and individuals to purchase fresh, flavorful fruits and vegetables that are important for good health, while also supporting our local farmers and economy. Tuesdays Eureka 10am-1pm June-October Old Town, 2nd & F St.
Tuesdays Fortuna 3pm-6pm May-October 10th & Main St.
Thursdays Eureka 10am-1pm June-October Henderson Center, Henderson & F St.